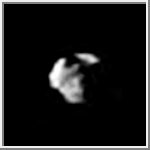 Helene was discovered by P. Laques and J. Lecacheus in 1980 through ground based observations. Helene is called a Dione Trojan satellite because it shares the same orbit as Dione at about 60 degrees ahead of its larger companion. Its diameter is about 36 x 32 x 30 kilometers (22 x 20 x 19 miles).